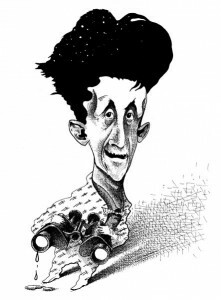 Considering Orwell’s views on language, it’s no wonder that the perversion of words for nefarious political ends features so prominently in Orwell’s dual masterpieces, Animal Farm and Nineteen-Eighty-Four. 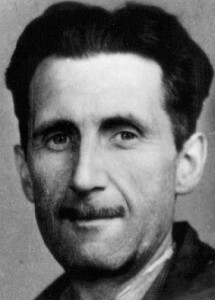 In Orwell’s imagined totalitarian worlds, tyrants control thought by debasing language and eradicating the vocabulary of dissent. Without the words for freedom, he argues, the idea of it ceases to exist. Most anyone who graduated from an American high school recalls, “War is Peace. Freedom is slavery. Ignorance is strength.” It’s usually read as a Cold-War warning against Soviet-style socialism and its attendant mind-bending fabrications. But we’ve forgotten Orwell’s broader message: Demagogues erode democracy insidiously and incrementally, camouflaging their designs (and outright lies) with lofty abstractions, meaningless slogans, and euphemisms. Anyone can invoke God and proclaim a love of peace. Hitler did so that autumn day after an extraordinarily long oratory, one which justified the invasion of Poland and blamed that “ridiculous State” for provoking him, with crimes ranging from committing atrocities against Germans to messing up the Vistula River. It was sanctimonious, cynical, and full of lies — totalitarian speechifying at its finest. How, you ask, is any of this relevant to non-politicians and, more specifically, to private investigators? To address the first question, I offer you this fascinating 2010 New York Times obit of economist Alfred Kahn, an outspoken proponent of plain English in public life. “If you can’t explain what you’re doing in plain English, you’re probably doing something wrong,” he wrote in a famous memo that urged fellow civil servants to write letters and reports clearly and succinctly. If that doesn’t seem like a high-stakes matter, consider this: What would happen if bills, laws, and the U.S. tax code were written clearly and succinctly? Answer: they’d be far easier to read and understand and less open to interpretation and arbitrary enforcement. And that would, quite simply, make us just a little bit freer. We learn this kind of linguistic evasion early in life. Not long ago, I heard a commentator discussing the human instinct for abdicating responsibility by removing oneself as the subject of the sentence. He’d caught his 5-year-old daughter cutting up an heirloom quilt and asked her, with some frustration, why she did it. “It happened with scissors,” she explained. In her phrasing, the scissors were somehow the actor, the quilt the acted upon, and she a bystander. Did she say this intentionally to get out of trouble, or did the phrase itself actually cause her to feel less at fault? The cause-effect relationship isn’t so clear. Orwell again:. In other words, when we write or speak poorly, we think poorly … which brings us to the second question: For investigators, why does any of this matter? 1. Clear communication wins (and retains) clients. When you meet prospective clients or attorneys, do you speak articulately and knowledgeably, with good grammar and simple, straight-to-the-point language? In your intake interview, are you clear about what you can and cannot do as an investigator? Do you get to the point quickly and ask prospective clients the best possible questions about their situation, to obtain information that will help you work your case? When you deliver your final report, is it well-written and carefully edited? Are your grammar and spelling correct? Is the report easy to understand, free of jargon, and written as simply and succinctly as possible? Master these skills (and do your job well! ), and you’ll not only impress clients; you’ll keep them. Articulate speech communicates not only intelligence, but an organized mind, and that’s what clients are looking for when they hire you to help solve a problem. 2. Understanding language helps you spot red flags. Consider again our discussion of the passive voice and what it sometimes indicates: a speaker’s attempt to distance himself from responsibility for an action. The better you understand English grammar and sentence structure, the more likely you’ll be to recognize subtle grammatical constructs that might expose something important about a witness’ or client’s psychology. 3. Clearer language leads to clearer thinking. Being a good investigator requires a number of critical thinking skills: interviewing subjects and comparing their testimonies with known facts; sorting through massive amounts of data and determining what’s important; resisting one’s own biases when confronted with conflicting information. These skills involve language and logic. It follows that using language in a clear, precise, and organized way can help clarify an investigator’s thinking, sharpen his powers of deduction, and organize his mind. And more disciplined thinking can help investigators avoid common logical pitfalls that sometimes lead us to incorrect conclusions. There’s good news about the poor language habits so common in public discourse: The damage is “reversible,” says Orwell. The English language, unlike, say, Newton’s Law, is a human invention, and one over which we have some influence. As Orwell points out at the end of his essay, we can (as individuals) choose to use language to express thought instead of concealing or confusing it. As investigators, we can practice the art of clear communication in life and work. When speaking with clients or attorneys, think carefully about what you’d like to say, then say it in the clearest, simplest possible language, free of jargon, euphemism, and wordy pretentiousness. Who knows? If we start composing our emails, testimonies, quarterly reports, Tweets, and Facebook posts in the honest, simple prose Orwell himself mastered, the habit might just spread throughout our industry. And if how we speak influences how we think, and vice versa, it just might be that talking to each other with respect, thoughtfulness, and intelligence might actually make us a little bit more intelligent, considerate, and reflective. Hint: Post those rules next to the computer. It’ll be almost like having Orwell as your own personal editor. 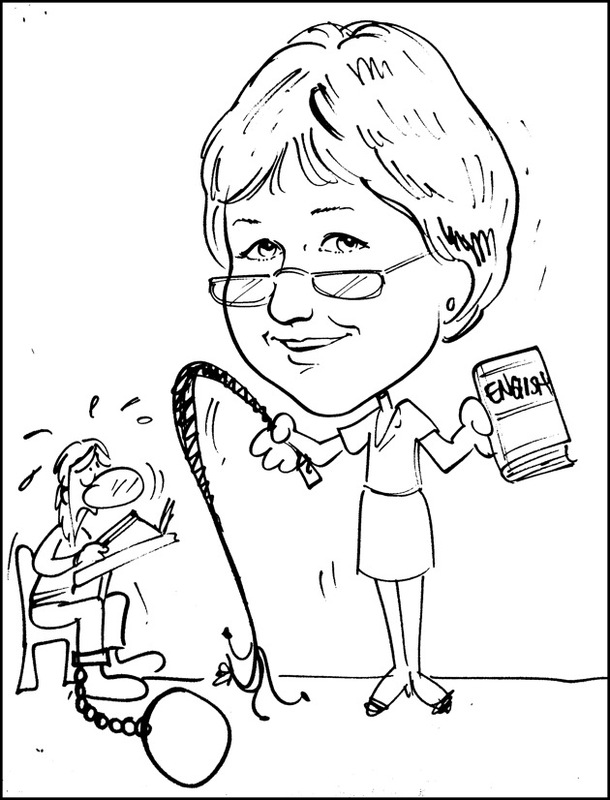 Do you have questions about grammar or communications best-practices? Ask The Grammar Examiner in the comments section. 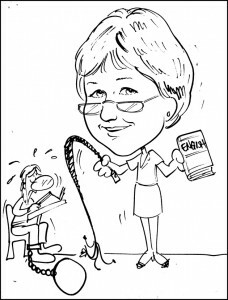 The Grammar Examiner taught high-school English for 40 years and was recognized by her citywide public school system as an outstanding ACT-prep instructor. A tough-love drill sergeant in the classroom, she was affectionately known as “The Dragon Lady” by her students, who dared not call her by this name in person.